From time to time, you have to hit the brakes on a project in Project 2016. For example, you may set up an entire project schedule, and just as you’re ready to start rolling, the project is put on hold, caused by a budget shortfall, priorities that have changed, resources being pulled to another project, or cold feet on the part of stakeholders. It happens, but it also happens that projects have a way of coming back to life. The good news for you is that if the essential facts of the project (such as its scope and the resources you’ve planned to use) haven’t changed, you can simply reschedule the entire project to start from a later date rather than rebuild the plan from scratch. This process reschedules both auto-scheduled and manually scheduled tasks so that you don’t even have to use your thinking cap. Choose Project, Go to the Schedule Group, then click Move Project. The Move Project dialog box appears, as shown. You can use it to reschedule an entire project that was put on hold. The Move Project dialog box. 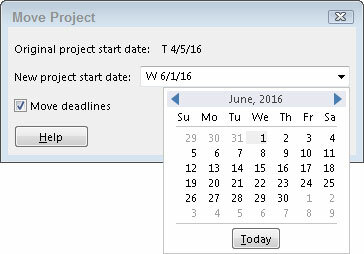 Enter the new project start date in the New Project Start Date field, or choose a date from the drop-down calendar. Select the Move Deadlines check box if you want Project to move any deadlines that are assigned to tasks.